A lot of you raved about how good my stuffed zucchini looked over my 4th of July weekend. And it was GOOOOD. So, I figured since so many of you thought it looked good, you might think it tastes good too :) I followed the directions completely the first time around. I think if i made it again I would add some sort of meat to it... perhaps a ground sausage of some type. Not sure. I just know that I live with a man who needs meat at each meal, so when I can incorporate meat into something that's good like this, it's much appreciated by the menfolk in my family :) And to fully disclose where this recipe comes from, it is from the July 2011 issue of All You magazine (pretty much an awesome magazine that has GREAT coupons! ), page 10. Bring 1 cup water to a boil in a small pan. Add rice, cover, lower heat and simmer until tender, about 40 minutes (note: this did not cook the rice for me, and I had to add water and cook for longer, so you may just want to follow the directions from the rice package). Scoop out the middle of the zucchini, leaving 1/4 inch rim (I'm pretty sure we left a bit more than that, which is ok). Chop zucchini centers. Warm oil in a skillet over medium heat. Saute onions until soft. Add chopped zucchini, mushrooms and garlic; saute 4 minutes. Stir in cooked rice, dill and mint; cook 1 minute. Stir in lemon juice and season with salt and pepper (I also used tony chachere's, which added a little kick to it). remove from heat. In a 9x13 pan (we actually had to use 2 pans, since our zucchini from our garden is so ginormous), spread tomatoes (do not drain). 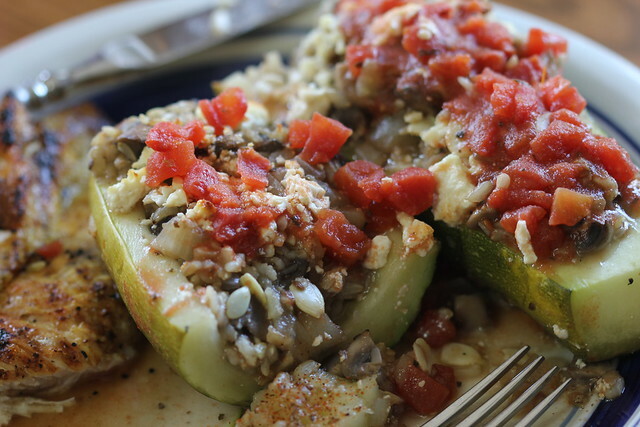 Fill zucchini with the rice mixture and place on top of the tomatoes. Top with feta if desired, baking until zucchini is tender, about 40 minutes. We served this with grilled chicken and it went well as a side dish. Like I said earlier, if you wanted to have it as a main course, all you would need to do is add some sort of ground meat to the mixture and it would work perfectly. Enjoy!